The blockchain technology have truly brought many incredible stuff into the modern world. Making sending and receiving payments happen within the blink of an eye. 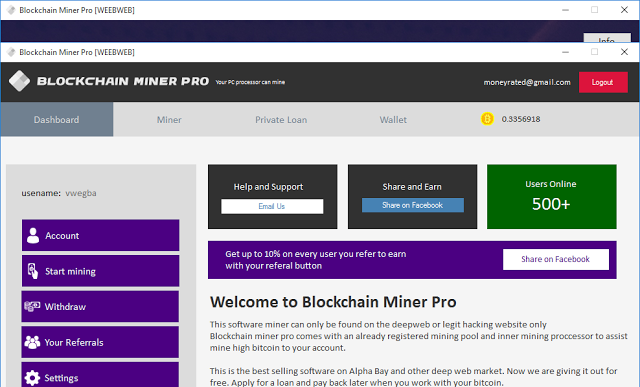 But there is a desktop application known as blockchain miner pro. This app was supposedly designed to mine bitcoin. This article talks extensively about this application and why you should beware from using the App. Blockchain miner pro is an app developed by DevTech. Nobody knows anything legal about this group of Tech gurus but you can come across them on YouTube by simply searching the keyword DevTech. They own and have a tutorial on YouTube claiming that this app can be used to mine bitcoin. But in truth, this App is a fraud and it is meant to steal bitcoin from its users. For example, this app runs in offline mode. And Bitcoin can’t be mined in offline mode. Aside from this, the developer of this app requires that you pay a bitcoin miner fee of 0.008 before withdrawal. Do not make use of this app and if you already have it installed in your laptop, it is advisable that you uninstall the app and run your malware to clean your laptop of possible virus or malware infection. The miner fee is sent directly to the owners of these app DevTech and you won’t receive the mined bitcoin. We encourage all our visitors to beware of blockchain miner pro app and not loose bitcoin. There are no short cuts to earning bitcoin, you have to perform one task or another before you can get free bitcoin. If you wish to know of ways you can earn free bitcoin, please CHECK THIS LIST FOR POSSIBLE MEANS OF EARNING FREE BITCOIN. For further details and enquiries please use the CONTACT US PAGE and send us a message.